The main view in the file system studio is a file explorer that allows you to browse and modify your files. 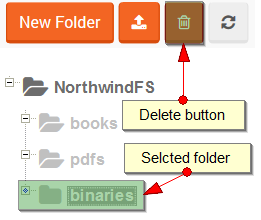 It has the standard layout where the directory structure is visible on the left side while a list files of the selected directory occupies right side of the view. The name of the file system in the directory structure means the root directory. $revisions folder is only visible when versioning bundle is enabled and it contain all revisions files. The folder remains virtual as long as it is empty. If you switch between studio pages without uploading any file there then it will disappear. To persist this folder you need to add a file there. A status of the upload operation is tracked by Upload Queue panel. If it finishes successfully it will be visible on the file list. Select a single document and click the edit button or click on its name to navigate you to File Edit View. 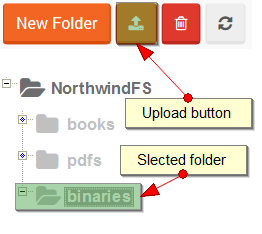 Select a single document and click the rename button.